While their music continues to stand the test of time, their numbers and stats are beyond compare. 50 years since starting the band, Alabama has charted 43 #1 singles including 21 #1 singles in a row and have won over 179 CMA Awards, Grammy Awards, and ACM Awards. They are members of the Country Music Hall of Fame and have their own star of the Hollywood Walk of Fame. They are also world-class philanthropists who have raised over 250 Million dollars for charity. 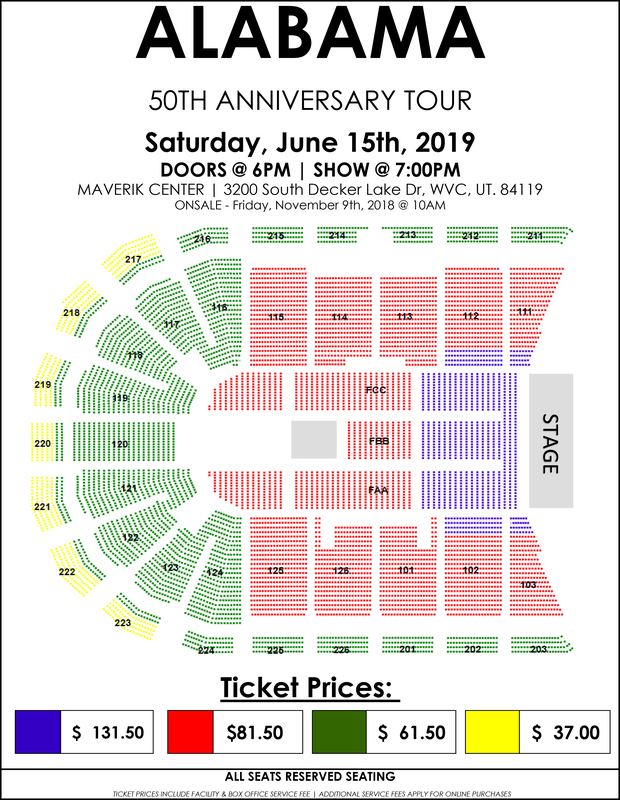 Celebrate 50 years of ALABAMA on their 50th Anniversary Tour coming to MAVERIK CENTER on Saturday, June 15. With special guest - EXILE - Exile formed in 1963 looking to play small clubs in Richmond, KY but managed to top both the pop and country charts during their more than 50 year-long career. Their most successful hit, "Kiss You All Over" spent four weeks at the top of the Billboard's pop chart in 1978. In the early 1980's, Exile started to focus on country music. During their run on the country charts Exile has successfully had ten No. 1 singles and many more top 20's. The band will also be releasing two new recording projects in 2018 featuring the newest as well as the greatest of Exile. The five original members of the band reformed in 2008 and continue to tour today.